Doctor Mist is a fictional character, a comic book superheropublished by DC Comics. He was created by E. Nelson Bridwell and Ramona Fradon, first appearing in a cameo in Super Friends #12 (June–July 1978). 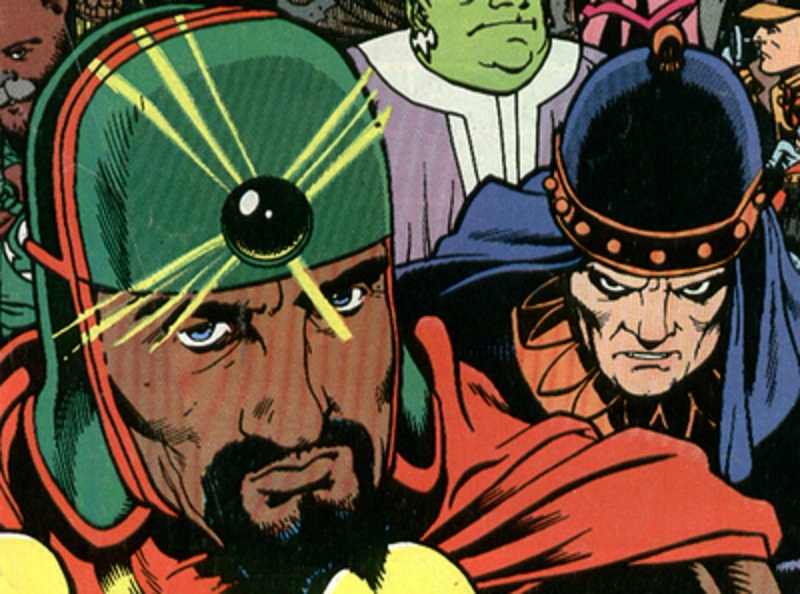 Doctor Mist is based on both the Guardian of the Gate and the character of King Noot introduced in Chapter 18 of Wisdom's Daughter by H. Rider Haggard. Team affiliations: Global Guardians, Leymen, Justice League Dark, A.R.G.U.S. Abilities: Immortality and the ability to cast spells of illusion and enchantment. Nommo, the wizard-king of the African empire of Kor, stood in the Pillar of Life and was endowed with immortality. He later took the name Doctor Mist. Doctor Mist gathers a number of international heroes to help the Super Friends battle the Conqueror. Later, Superman teams with several international heroes at Doctor Mist's request. He is the one who first gives them the name The Global Guardians. Superman and several of the Guardians would team up to fight against the threat of Thaumar Dhai and the squad of powerful wizards who worship him. Dhai was defeated when his objects of power turned out to be Superman-created fakeries. The team later fights against the Shadow Demons in the Crisis on Infinite Earths. The Pre-Crisis history of the Global Guardians is no longer in the mainstream continuity of the DC Comics universe. In 1957, the newly-formed European Economic Community established the Dome, a supra-national police organization. At some later point Doctor Mist formed the Global Guardians to serve as a task force for the Dome. Decades later, the Dome lost its funding when, in part because of the political machinations of Dr. Klaus Cornelius, the United Nations decided to close the Dome and instead fund the new Justice League International. The Global Guardians then fractured with Doctor Mist and his assistant Belphegor, disappearing. Queen Bee of Bialya rebuilt the Dome in her country. She then brainwashed the Global Guardians into her service also creating an android Doctor Mist to lead the team. Later on, Doctor Mist reappeared and helped Guardian members Jack O'Lantern and Owlwoman escape Bialya. Doctor Mist recruited a team to free the rest of the Guardians from Bialya mind control and then reformed the Global Guardians, building a new Dome headquarters somewhere in the Pacific. An eternal, Mist's physical body was slain by an ancient force. Nonetheless, he did turn up alive and seemingly well after the Zero Hour crisis. At this time, calling himself Maltis, he formed a new team of heroes known as the Leymen. The group was short-lived. Maltis' time on the team even shorter as he had a heart attack soon after the team formed. Later, he was seemingly killed after being thrown into a pool of acid by the evil Mordru.